This beautiful Edward Joseph Lowe Fern (Gymnogramma Rufa & G. Tomentosa) Antique Botanical Print was printed 1856 and is an original book plate from E. J. Lowe, Ferns British & Exotic. Printed in colour from a wood block engraving with a little hand finishing. This is a first edition actually printed in 1856 and not a modern copy or reproduction. This Lowe print is guaranteed to be over 160+ years old. We do not sell modern reproductions. The page is approximately 24.5 x 15 cm's or 9.6 x 5.8 inches. Please note the frame border shown in the first image is NOT INCLUDED in this listing. It has been digitally added to the print shown in the second image as an illustration of how beautiful these fern prints look when matted and framed. 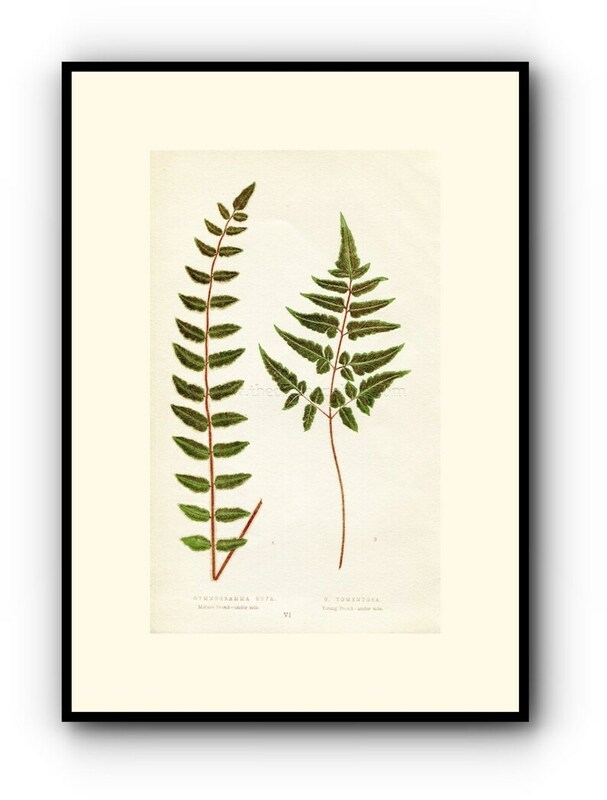 You are purchasing the fern print only unmounted and unframed. Please study the large scanned second image for all details. The digital watermark is not on the actual print. Happy to combine shipping for just the one cost if more than one print is purchased. This is the third time I've purchased from this shop and I have been delighted every time! The products are so high quality and beautiful. Since I live in the U.S., obviously it takes a few weeks for delivery, but it's so worth it! Thank you! Fast communication and shipping. Map was as described....very nice. I have bought from him before and I am always happy with the transaction. We accept Credit Card payments through Etsy Payments & Paypal. Thank you. We offer a no questions asked returns policy. If not 100% satisfied with your purchase simply email us within 1 week of receiving it to let us know you wish to return for a refund less shipping costs. All returns must to be sent by a tracked shipping service for your protection..
We post daily Monday-Friday. We will confirm dispatch via email.